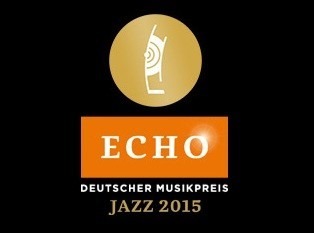 All of us at OKeh Records are very proud to inform you that seven of our Jazz artists have been nominated for the most important German music award: ECHO Jazz 2015. The winner will be announced at the award ceremony on May 28th in Hamburg. For a complete list of nominations, visit echojazz.de. 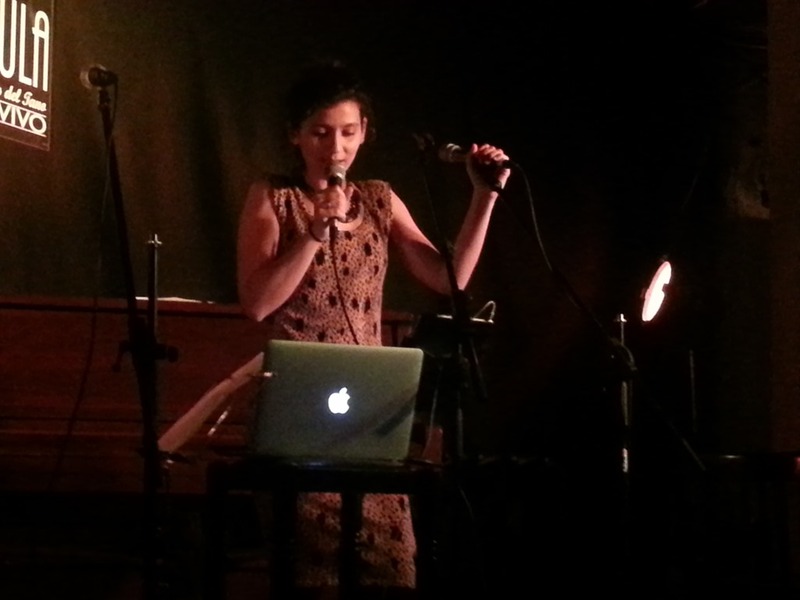 Almost 2 years ago I wrote the following in one of my blogs: Went out to see Ariadna Castellanos yesterday – a young and immensely talented pianist, who plays flamenco on the piano, with power and feeling and a lot of fun. 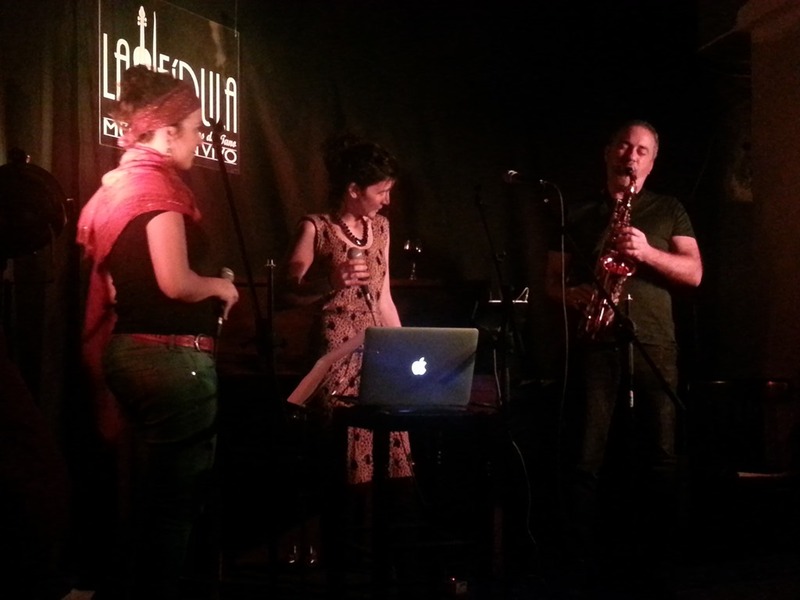 The presentation of her debut album ‘Flamenco en Black & White’ at the club Clamores was a great show with several special guests, including singer Sandra Carrasco. As her producer Javier Limon said in the introduction: She is not playing the guitar – she is not a man – she is not a gypsy – but she surely plays Flamenco! Now I saw her again perform, this time at the club Bogui Jazz – she is definitely more confident, more relaxed and so is her music – still deeply rooted in Flamenco, she performed solo, just with percussion and in a trio, adding a sax to the mix. When I saw her 2 years ago I could hear her classical training in the way she played and improvised … that is not the case anymore, she has surely matured and her embellished improvisations on the flamenco themes and rhythms show her progress clearly. 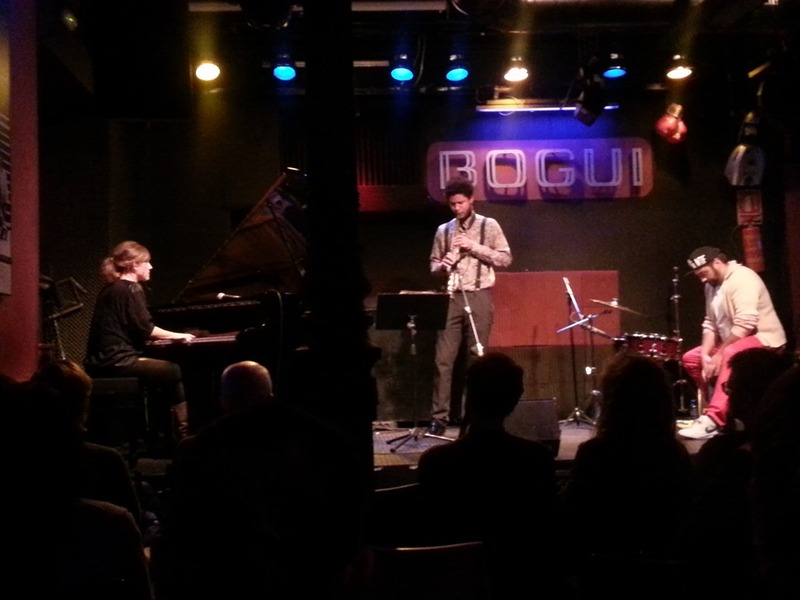 The moments with the percussionist were interesting as some understanding was there, but the trio hadn’t obviously played together before and one could hear that – still good, but they will need a few more gigs under their belts to make it great and easier flowing. I hope I won’t take another 2 years to hear her again, as she is worth seeing develop. Josemi Carmona is one of my favourite guitar players here in Spain – versatile and always open for something new. Being the ‘young one’ in million selling group Ketama, he got the openness to music from his father, Pepe Habichuela, with whom he played with Dave Holland for a while. Then he started his connection with keyboard master Bugge Wesseltoft, being a member of his group OK World and performing with him around the world. 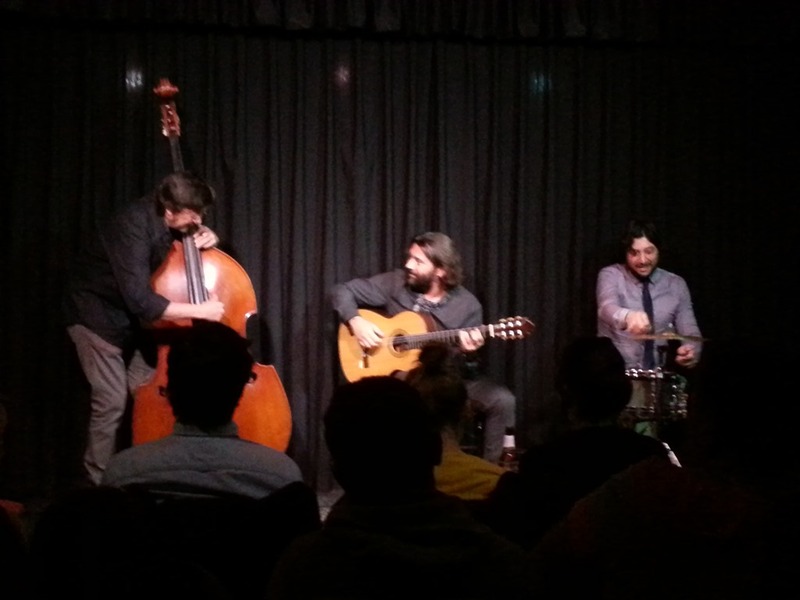 He is making himself a name as composer and producer as well and last week performed in Madrid with a trio that included percussionist Bandolero and leading Spanish bass player Javier Colina – all three masters of their instruments and they had played together before, backing up Jorge Pardo. The repertoire was very much on the Latin side: from jazzy Flamencos to Mexican composers (Consuela Velazquez among them) and Antonio Carlos Jobim … all done with great style and arrangements which gave the musicians room to play around, improvise and generally having a good time in each other’s company. The all-acoustic setting of the small room helped to create an intimate atmosphere and the musicians showcased their skills in the service of the songs … listening to each other, supporting the soli with subtle chords and rhythms. If these guys are going to play more often together, this trio could be really something else. Let’s just hope they do. Club La Fidula, Madrid, January 29th. The young woman steps on the stage and welcomes the twenty something people in the audience … then starts putting some vocal snippets into her loop machine … a second layer, creating a beautiful groove and then starting to sing on top of these loops … constructing captivating atmospheres and showing what a great singer she is. Originals, standards (like a great version of Nat King Cole’s Calypso Blues) and covers …in English or Spanish or Catalan … she makes it all her own, doesn’t seem to be bothered by limits and genres, enjoying the moment of music making and sharing this joy with the audience. I saw Paula Grande for the first time at the Montreux Academy in October last year and was impressed by the few songs she did there in a kind of jam situation – she had been in the Montreux Vocal competition and then invited to the Academy to meet other musicians and hear and learn about all aspects of the music business. As she lives in Barcelona, she told when she would be in Madrid and I was glad to go out and see her perform … as she showcased her amazing talent in different ways … as described above just being her own band, creating the rhythms and patterns to walk on and perform solo, or with some friends she invited to the club in Madrid to perform with her – first a guitarist who sang with her, than a female vocalist together with a sax player, who opened up her music and added some gorgeous lines on his instrument and last, but not least, a young rapper who improvised his lyrics on top of her vocal loops with great feel and power… and she answered him in an improvised rap, which was pretty impressive as well. Overall a big surprise, as she kept all the various sounds and musicians together by being herself, giving them space and direction, but always staying in control of the song and where she wanted it to go. Paula is now working on her first album and I am sure it will surprise a lot of people in a positive way. A singer who is at home in jazz and many other genres and who seems to find her own voice, combining all the genres she feels at home with into one unique sound. One to watch for the future. Nomen est omen! · David Sanborn recorded a new record with producer and bass player Marcus Miller, with whom in the past he had worked very successfully. Time And The River as well features special guest appearances by Randy Crawford and Larry Braggs, the voice of Tower of Power. · Silje Nergaard has delivered her album for a March release entitled Chain of Days. The album features a new song she sings together with Kurt Elling – absolutely amazing. Watch out for that one. · Grammy winner Irvin Mayfield and his New Orleans Jazz Orchestra invited none other than Dee Dee Bridgewater to record with them and the result, Dee Dee Feathers, is a great New Orleans groove record with some incredible performances – check out your local gig guide, they will be around from May onwards! · The sound track to the music documentary Playing Lecuona, which features Michel Camilo, Chucho Valdes and Gonzalo Rubalcaba, plus special guests, will be ready as well for a spring release – some great music here to check out. That’s it more or less for the first half of the year. Keeps me busy !